Man, this heatwave has me itching to start some shopping for Spring… Luckily, I recently had the good fortune to spend the afternoon up at Saks OFF 5th in the Fashion Outlets of Niagara Falls to check out some of their latest offerings for Spring and select some of my favorite pieces for one of their upcoming publications. With this current spike in temperatures, now seems like the perfect time to check out some of the season’s hottest trends. One of the best things about many of the stores at the Fashion Outlets is access to exclusive brands you won’t find anywhere else in the area. This Basquiat collection from Eleven Paris is exclusive to Saks OFF 5th and is favorite of mine this season. Naturally I had to pair this jacket with a pair of paint-splattered pants. Military-inspired trends continue to be huge for Spring, with camo patterns and embroidered Bomber “Tour Jackets” being wardrobe essentials. Paired with a floral button down and causal sneakers, this look is perfect for wearing during the day or night. What would Springtime be without Spring Break? 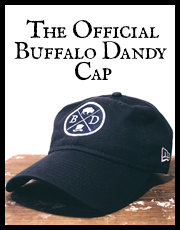 Looking your best while you travel is always a must with Buffalo Dandy, and Saks OFF 5th has everything you’ll need to look your best while on Spring Break. Grab one of their handsome Cole Hann weekender bags and pair it with a brightly colored floral Bogosse button down, a Hugo Boss blazer, some white spill-proof denim and don’t forget the Alligator Loafers. Now you’ve got everything you’ll need for one unforgettable Spring Break. Here is another look from our photoshoot at The Fashion Outlets of Niagara Falls which offers some great inspiration for What To Wear to your upcoming holiday party. Professional yet comfortable, this outfit has plenty of elements to make sure you show up looking your Dandy best this holiday season. As I stated in the previous post, Saks Off 5th is an easy one-stop-shop for looking your Dandy best. Plus many of their blazers are cut so perfectly (like this one from Hugo Boss), you might even be able to skip the trip to the tailor. Playing with some Holiday colors like forest green and brown to compliment the deep blue herringbone blazer, the knowledgeable staff at Saks can help you make sure your accessories compliment rather than match perfectly so you don’t look like you’re going to a wedding. I couldn’t walk out of just one pair of pants at Levi’s, so when I was in the store they showed me their newest 511 pants that were actually made from flannel so I knew I had to give them a try. Trust me when I tell you, you will fall in love with these pants. They fit perfectly and are so soft and comfortable I intend to be living in these for most of the Winter. This cotton scarf I found in the store also added just the right amount of European flair to outfit to make it slightly more casual in case you don’t feel like wearing a tie. Lastly, I finally rediscovered one of my favorite loafers of all time from the Clark’s store. The Bostonian Loafer has extra padding on the sole and are the perfect shade of brown which I have had an extremely difficult time finding anywhere else. Once I spotted them out of the corner of my eye, I immediately recognized my old friends and slipped them on like they never left after being loved (worn/chewed by the dog) to death. Looks like the Kentucky Derby is going green with envy this year with a sharp looking new logo and their always coveted $1,000 mint julep cup which arrives this year in limited edition package complete with a custom silk shirt lining designed by Hamilton Shirts. A well-documented favorite day of the year here at Buffalo Dandy, we’ve compiled some of our favorite new items of the season to serve as inspiration for what to wear while attending or watching this year’s Kentucky Derby. Fingers crossed that I continue my winning streak on who wins. Good luck and stay Dandy everyone! Spring is a tricky time fashion-wise because while many of us welcome the warm weather, some of us are hesitant to relinquish our favorite winter wardrobe staples. This is when proper layering becomes essential and introducing a few new transition pieces will really pull your outfit together. We’ve combined some of our favorite trends from this past season (longline jackets and sweaters) as well as some emerging ones (all black everything) to create a look perfect for the gloomy weather usually associated with the Springtime in Buffalo. Favorites include this new take on the bomber jacket trend that was everywhere this Winter with an updated longline silhouette from ASOS, a new color option from my favorite H&M hoodie, J.Crew Oxfords which have replaced pretty much every other shirt in my closet, these incredible looking double monk sneakers from TAFT and the new murdered out Filson Dutch Harbor Watch which is straight killing it in the watch world. Always a highly anticipated event is the annual Johnny Onion Ride by the BLRC. Last years ride was a huge success with gorgeous weather and by the looks of things, we’re going to have more of the same this year. 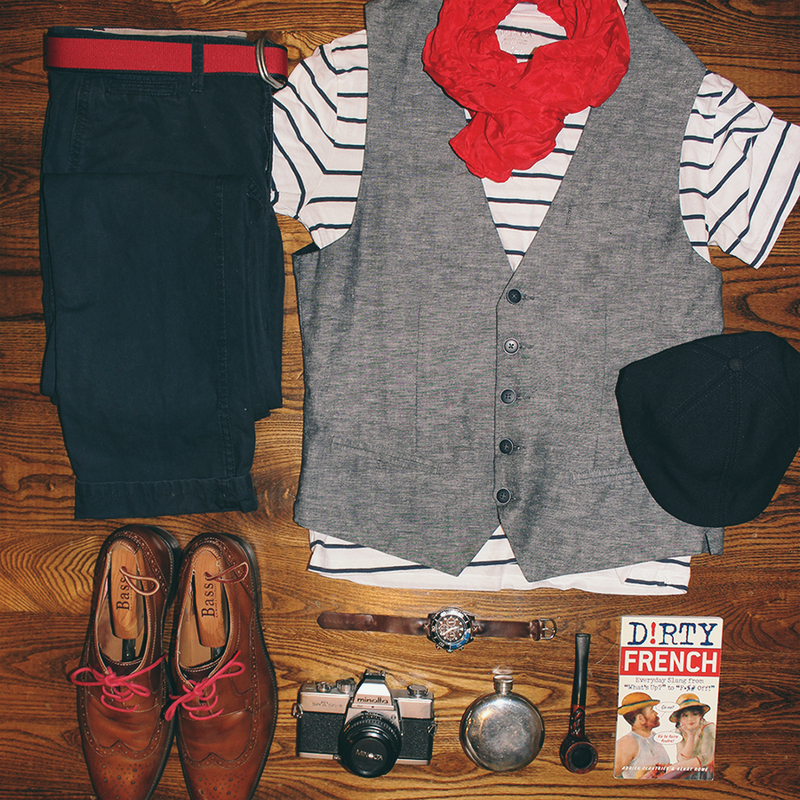 As per usual, if you’re looking for French-inspired clothing like striped shirts, berets and neckerchiefs, Uncle Sam’s Army Navy Outfitters has everything you’ll need. Just don’t forget the onions! Salut! Summer is making way for Autumn. That means it’s once again time for the darling of BLRC runs. 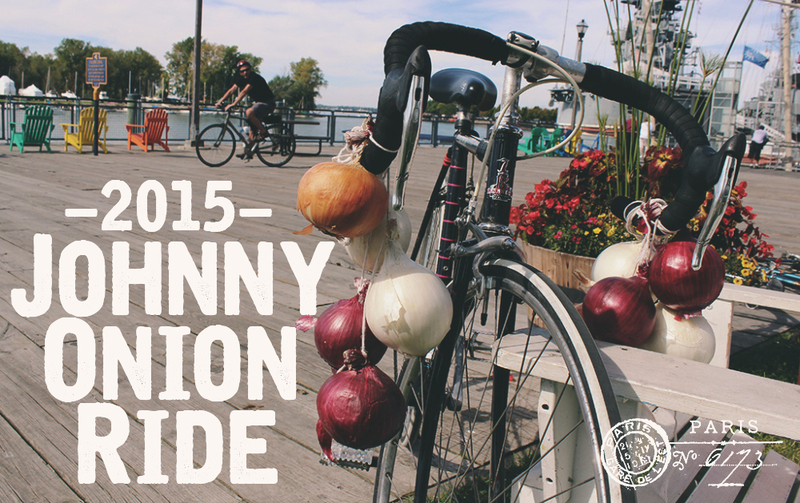 The Buffalo Lazy Randonneur Club hosts our fourth annual and the world’s only Johnny Onion Ride. On this day we pay homage to AR JOHNNIGED BRO ROSKO, the pedaling peddlers of Breton’s famous Roscoff onions. Under their adopted moniker of Onion Johnny, these intrepid farmers have peddled their onions throughout Great Britain on bicycles. After crossing the channel by ferry, the Onion Johnny strings his bicycle with a hundred pounds of prized onions to sell to homes and restaurants. We will not ask so much of you. We do ask that you outfit yourself in [stereo]typical french maritime or farmer style. Stripes, Berets, Neckerchiefs, etc. Also string a few onions to your own bike and we will add them to a cauldron of french onion soup made at the end of the ride. 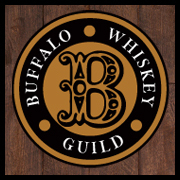 We gather at noon on the first Sunday of autumn at out waterfront park, a port of Buffalo’s own ferry. From there we lazily ride along bike paths to the rose garden pergola at Delaware Park, our nod to the english rose. Feel free to bring any other refreshments or picnic fare you like.